The Aztecs discovered the tuberose as far back as 1519; described as one of the earliest cultivated plants. The Spanish introduced her to Europe where her popularity grew with Victorian ladies. Mood gardens were established; a collection of white or pastel flowers which release an intense fragrance after dusk. 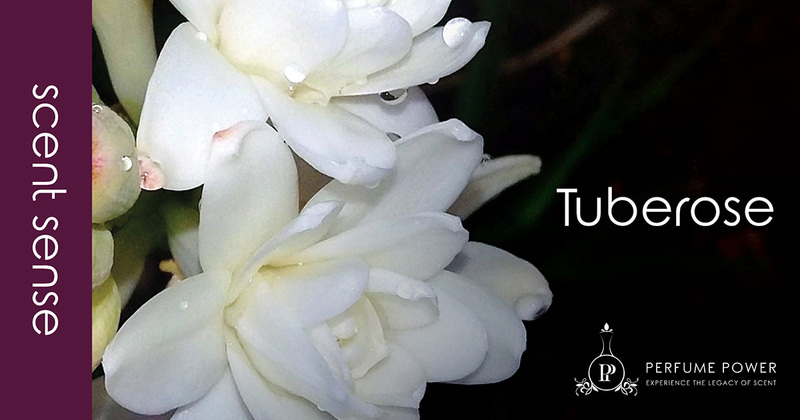 History shows that the tuberose was brought to India in the 16th century. Her flowers are used in garlands, various traditional rituals, funerals, decoration, wedding ceremonies and perfumes. Interestingly the tuberose in not related to the rose family in any way. It has its name because it forms a bulb-like stem underground which is called a tuber. The plant is night-blooming. The tuberose blossoms are actually still in bud when picked so they can give off their full spectrum of scent as they wilt. It takes over 1 200 kilograms of buds to render 200 grams of tuberose absolute, which makes tuberose one of the costliest natural raw materials to use. No note in perfumery is more surprisingly carnal, creamier or contradicting than that of tuberose. She boasts a mix of flower shop freshness and velvety opulence. Not surprizing that the flower meanings are both pleasure and voluptuousness. Perfumer Roja Dove is right when he says that tuberose is really loose, the “harlot of perfumery”. A few tuberose fragrant masterpieces are Carnal Flower in the Frederic Malle niche line Editions des Parfums, Fracas by Robert Piguet, Chloe by Karl Lagerfeld, Jardins de Bagatelle by Guerlain, and Amarige by Givenchy. Scent inspired gifts for the holiday season!